Thanksgiving is nothing without tradition, and I have my tried-and-true turkey recipe I make each year without fail. There's another tradition that has developed more recently though, one of a full Thanksgiving meal made about month prior to the holiday, where I gather my friends and turn them into human guinea pigs to taste test new turkey and other recipes I've been developing for the blogs. 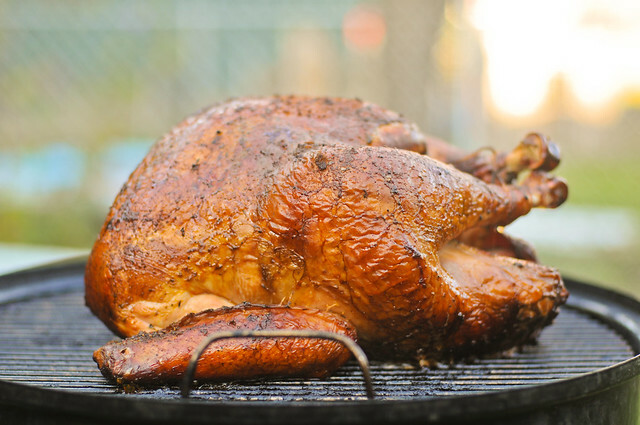 This annual event is now about five years old, and with each passing year, finding a new and unique take on grilled or smoked turkey has become more challenging. I've increasingly been turning away from the traditional notion of holiday birds and to doing more inventive incarnations, like this Cajun smoked turkey. A turkey is actually a thrilling prospect. Gone are the days of dreaded dry cardboard birds, and ushered in its place has been a renaissance of juicy and flavorful turkey masterpieces. So what has been the big change? It's a one-two punch of brine and smoke that breaths life into this blank canvas. Yes, I'm a slave to the brine, and preach it wherever I go. I thought it was the end all, be all for juicy and flavorful poultry for a long time, that was until I started dabbling in injections. Like a brine, an injection can add moisture and flavor into meat, but at a much quicker pace. 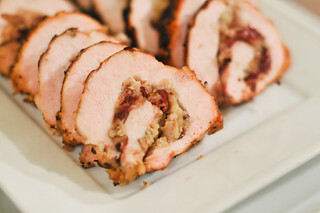 I find overall it's not quite as effective in altering the moisture and texture of the final bird, but it does a better job of adding flavor throughout, effectively embedding deposits of seasoning into the meat. I thought an injection was better than a brine in this case, where I wanted to season the turkey throughout with Cajun flavor. Liquid crab boil was the dominante seasoning used to accomplish this, but it had some help in the way of garlic, Worcestershire, Creole seasoning, and hot sauce as well. Beer acted as the liquid that supported all the seasoning, and butter was added to enhance the richness of the meat. 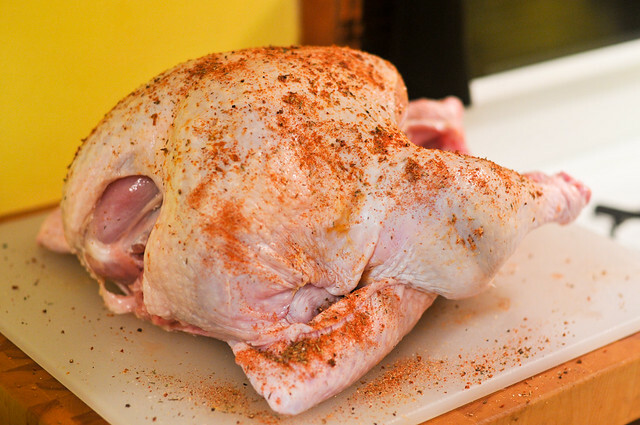 Once throughly injected, I coated the bird with a Cajun spice rub to add another layer of flavor that rested on top of the skin. While a brine would have made the entire prep process take about twelve hours, this bird went from packaging to the smoker in just over 20 minutes. It's the smoker that's the second part of the equation to the most delicious turkeys ever. Having a lightly flavored meat, any addition of flavor is sure to be picked up, and while the injection gets us a long way there, the introduction of smoke only makes it all the better. Less is more here though, since over smoking can quickly turn a bird from delicious to acrid. Just one chunk of a light smoking wood—like apple or cherry—is all that's really needed to give a turkey a smooth smokey flavor. 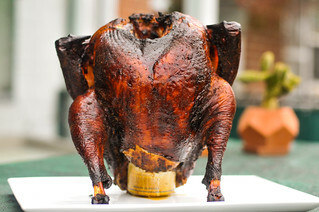 While past brined birds have had a more subtle flavor, this one came out packing a punch. The injection left the meat juicy and heavily spiced throughout, giving it a heat that was always present, but not so strong that it overwhelmed the light smokiness. The biggest surprise here though was the skin. 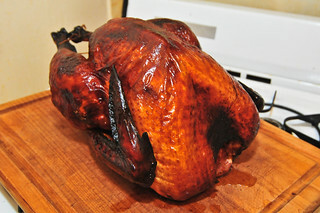 While most smoke turkeys I've done have come out with tough and leathery skin, this was thin and crisp. Not sure if it was thanks to the bird, process, or a littler of both, but the entire thing was a delight to eat. Now I don't think this bird will replace my usual on this year's Thanksgiving table—I'm a sucker for tradition and it'd be hard to get me to change my ways—but if you're looking for something a little different, this Cajun smoked turkey is worth giving a shot. Taking a holiday tradition in a different direction, this Cajun smoked turkey has a lightly spiced meat that compliments the smooth smokiness to form one full-flavored bird. 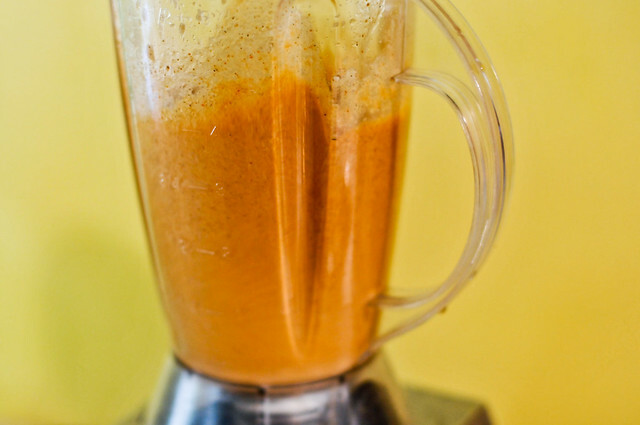 To make the injection, place beer, butter, garlic, Worcestershire, Creole seasoning, liquid crab boil, hot sauce, salt, and cayenne pepper in the jar of a blender and puree until completely smooth. 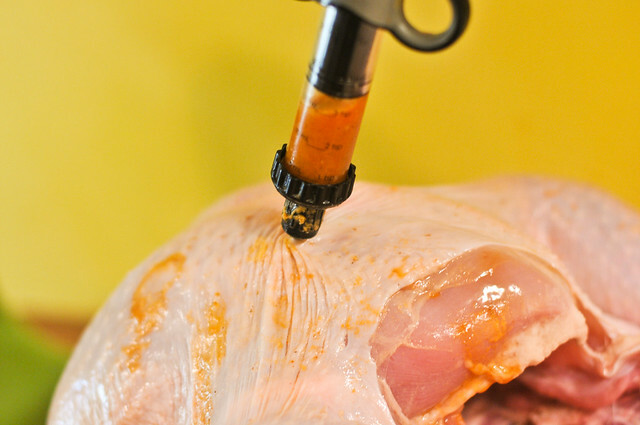 Using a meat injection syringe, inject mixture into meat of turkey all over with each injection spaced about 1-inch apart. To make the rub, combine paprika, garlic powder, onion powder, thyme, oregano, cumin, salt, black pepper, and cayenne in a small bowl. Season turkey inside and out with rub. 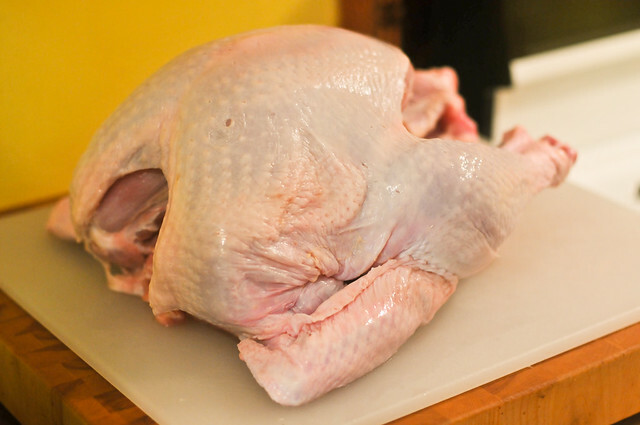 Fold wings under the body and tie the legs together, then brush entire turkey lightly with vegetable oil. Fire up smoker or grill to 325 degrees, adding smoking wood chunks when at temperature. 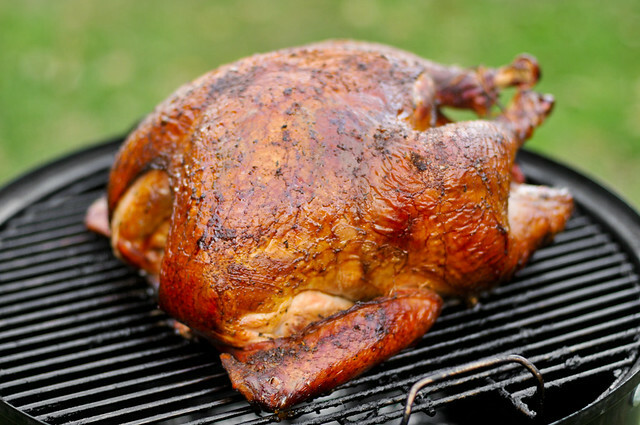 When wood is ignited and producing smoke, place turkey in smoker or grill and smoke until an instant read thermometer registers 165 degrees in thickest part of the breast, about 2 to 3 hours. 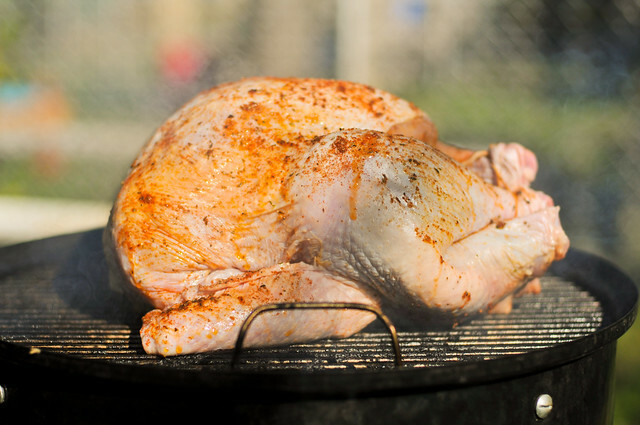 Remove the turkey from smoker and allow to rest, uncovered, for 20 to 30 minutes. Carve and serve. Pete! I had no idea (and now I'm beginning to) that you were such a chef, photographer and writer!!! I've been following for a few months now and cannot believe the level of cooking and sharing you do - while having a full time job and 3 kids!!! You should teach a class - I would come - I don't know enough about cooking meats - I could swamp you some bread or cheesecake?? W O W - truly impressive!!! Sounds like a great injection! Did it discolor the meat any? Beautiful bird. Do you have any idea why the skin turned out better on this one than your last couple of (documented) attempts? Do you think forgoing the brine had something to do with it? I will be smoking this TG and I am sick of leathery skin. @John I'm not really sure why this one came out and others haven't. I don't think forgoing the brine made the difference, since brines don't seem to effect the skins on chickens I cook. If anything, I think it was the butter in the injection, and the temperature in the smoker may have been higher than normal. I know in the oven I roast my turkeys at high temps (400-425) and get much better skin that way. Those look soooo good. I just ate and I'm drooling. And they seem like something I can actually do given my busy schedule. I found this cute little comparison of pre-made cranberry sauces and for anyone reading this who is like me and always pressed for time, I'm sharing this because I hope it helps: http://www.pressdisplay.com/pressdisplay/showlink.aspx?bookmarkid=JP3ZW5KGATY7&preview=article&linkid=6325fa3b-a096-4fe5-a9d7-ab6410fb6c4c&pdaffid=ZVFwBG5jk4Kvl9OaBJc5%2bg%3d%3d Love you all. Happy Thankgiving! I'm trying this with a big chicken. Thanks for the recipe!! Do I need to put.the turkey on a foil pan before placing on the grill? The bottom won't burn? @ShondaB No, you should need a foil pan. As long as it's not over direct heat, the turkey won't burn. This bird turned out amazing!! Our only problem was maintaining temp, in that case, it took about 5 hours-but was WELL worth it. Could you pour a little beer in the cavity while it cools? Would it help, hurt, or not make a difference? While it cooks I mean. @Keith Don't see any reason to do that. It'll likely hurt more than help, creating steam and taking longer to cook and could possibly have a negative effective on getting the skin a little crispy. I want to try this recipe... however- The smoker at my family members house I will have to use is a barrel style but it%u2019s direct heat as it has no water pan like wsm. I was going to spatchcock and flip a few times and aim for 325-375 temp. Do you agree with my assessment?